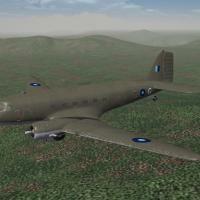 This pak contains Skin/Decal mods for the Stock 3rd Wire C-47A, representing RAF Dakota's in WW2, in the India/Burma (SEAC) theatre. None of my research has turned up an information if they were camoflagued, so the aircraft is in standard OD/Grey. Supplied are 26 plane-in group letters and RAF serial number decals. The serials, while correct for the Dakota, represent no particular unit and should be considered 'generic' in nature. There are NO squadron codes. Also supplied is an updated/edited/adjusted C-47A User list, with many corrected dates. As always, fairly easy to follow, yet detailed install instructions are included. So, please =READ= them BEFORE installing this mod!! !